Since we’ve been back, we’ve shared many Guatemala stories with our friends. I’ve sat around the table eating chips and queso with my two best friends and told them what I saw and experienced. Greg shared with his Bible study friends on a Tuesday morning. Cate has offered her own perspective – and told people in the grocery store and at the public pool about her decision to get baptized. We’ve shared pictures and stories … and answered all kinds of questions. How did you choose Guatemala? We knew our neighbors Kim and Stephen Crouch had led trips there so we had them over for dinner in November to learn more. Personally, I was drawn to the fact kids could go and the time change was only an hour. I also liked the relational element. The Crouches have been going to serve with Bethel Ministries International for seven years and know the missionaries well. BMI serves all throughout the country, hosting teams in different towns. Even though I had just met the Crouches, we have a slew of mutual local and college friends. I had also seen the way people who had traveled with them to Guatemala before stayed involved with the fundraising and planning for future trips. What did you all do there? 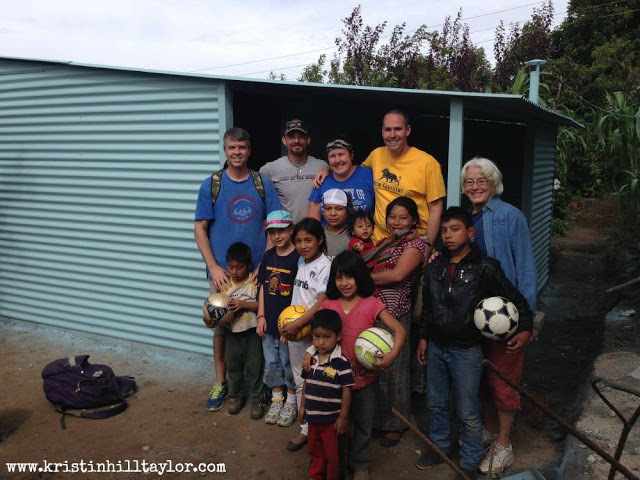 Throughout the week, our team of 13 people plus the four missionaries who live there divided up most days to serve. We also worked with a local pastor and volunteers who knew how to speak the Quechí dialect many of the local people with Mayan roots spoke. You took your kid to a third-world country? I did. And, honestly, she’s a huge reason Greg and I believed we were supposed to go. After initially talking to the Crouches, I thought we would wait until Ben could go too. But neither Greg nor I could shake the feeling we were supposed to go. I talked to other friends about family mission trips and, although I was intrigued, I kept coming back to this one. We committed to go in January and in the months after we participated in various fundraisers, which paid for the projects and materials. We paid our own way for the travel and food costs. Before we left, I talked to Cate about things – like how she may see a woman nursing a child older than a toddler because food options are limited and how she doesn’t know the language so walking away from us was never allowed. I never worried about taking her and didn’t regret our decision once we were there. I did have to explain what a man drinking himself to death means. And I thought I was going to have to explain what Rahab did before she was used by God, but she clung to another detail of that morning’s devotional. Cate is 8 but has common sense and is a deep thinker. As a family, we can talk all day long about generosity and continue to serve here in our local community like we do, but Greg and I believed showing her actual poverty would be life-changing. No, actually. Another group from our area went in June – to the coast, where it was hot. We ended up with nearly perfect weather in the mountains. It was in the 70s most days and got into the 50s in the evenings. We had layers and jackets. It was the rainy season, but we managed to only get rained on one afternoon … and the guys had just finished putting on the new roof at a house. It was hotter when we moved south to the beach for our last day in Guatemala. But even then the temperature was pleasant and some clouds kept us from being drenched in sweat. So, basically, the weather was better on our mission trip than it apparently was at home that week. Had you been in a mission trip before? No, I’d never been on a mission trip. Greg had been to the Bahamas with his college campus ministry. To serve together was definitely an aspect of this I looked forward to. Really, though, Cate deciding to get baptized wins for obvious reasons. But the day spent building the second house and exchanging friendship bracelets with Maria, Brenda and Angelica may go down as my favorite. No, not really. I can understand some, but I don’t speak it. Please don’t tell my high school Spanish teacher. She’ll be disappointed those four years didn’t amount to more. I hope so – and so do Greg and Cate. Honestly, the fact I hope to go back surprises me. Before we went, I figured the trip would meet the need I felt inside to go. And it did. But it also opened doors I didn’t know were there. I love what Bethel Ministries does and I loved hearing about a new ministry happening in another part of Guatemala to serve orphans and single moms. Landon Divido, who is working with Bethel as an intern this summer, is preparing to marry his fiancée Amy and then help the ministry his dad started open a rescue center in Poptun, Guatemala. This will help orphans as well as single moms who need childcare so they can work to provide for their families. These are the kind of ministries I want to be a part of, even from a distance and hopefully one day on the ground again. We spent the week serving in Chichicastenango, Guatemala alongside Bethel Ministries. We saw up close the poverty cycle that paralyzes families. Families often choose between food and education. Many suffer continuously because of the dirt and dust that builds up in their houses, that is, if they have roofs to cover them. Bethel works with families all over Guatemala to help meet their needs while sharing the gospel. Some of that happens through food and education sponsorships. A monthly $50 food sponsorship feeds a family of 4 for a month. Education sponsorships are $25 for children in primary grades and $50 for those in secondary grades. We would love for you to join us in serving this part of the world through sponsorships for some of the families and children we’ve met this week. Through Bethel, 100% of the sponsorship money goes directly to the family. If you’re willing to commit to this let us know and we’ll get you more information about a specific family or child as well as how you can make your monthly contributions. You can also read more about what Light of the World Ministries is doing in Poptun and join in those efforts. And if you have more questions, feel free to ask me. We’re all friends around a table here. Kristin- You and your family are so inspiring. Thanks for documenting your trip so beautifully! I'm especially glad you took your daughter. Any lessons she learned about compassion, gratitude, hard work, and love will surely outweigh any shocking sight or disturbing story. Thank you for obeying God's call in so many ways. Your life reaches farther than you know. Now- I'm going back to re-read and look at pics! Love this! I love this! I know I want our clan to go on a mission trip! I believe it brings the focus back on God and others…in return bringing our family closer together. I just need to wait until our guys get a little bigger 🙂 LOVE the picture here! Thanks, Bethany! I had so many pictures but this is one of my favorites too. YES – serving together was such a blessing in so many ways. I love hearing about your trip, Kristin! Congrats to Cate on her baptism. Tell her welcome to the club ;)! So glad you all are home safe and had such an amazing experience. My daughter is on a mission trip right now. The second of many I'm sure. She absolutely loves them! It is definitely her calling. Perhaps her and Cate will cross paths one day :). Thanks, Candace! Hoping your daughter has a wonderful experience too. Where is she? Kristin, I have so enjoyed reading about this trip. It is amazing the various ways God works in our lives, and thus the lives of our children, to think about missions and others. We truly reap so much blessing from putting our faith in action. Blessings! FAITH IN ACTION are three pretty great words too. 🙂 Thanks for your encouragement and for being here, Joanne! 🙂 So true & I didn't even realize it also was three words! Hi Kristin! I enjoyed hearing about your trip to Guatemala. I remember many months ago when you mentioned going in one of your blog posts, and am so glad that it was everything you hoped for. What a great experience for your daughter, too! 🙂 I'm in school to be a physician assistant (PA), and have this desire to do some medical mission work. Hopefully I can make that a reality! I hope you can do that too, Laura! Thanks for being here! I wish there were longer mission trips,especially for seniors graduating from high school. I think many would benefit from 6 months in the mission field. What a blessing for your entire family – and those whose lives you touched! That thought crossed my mind when it was time for us to come home. Thanks for your encouragement! Great Q&A Kristin – such valuable information for anyone praying over a trip. I really like that Cate got to go too – and the things you shared about the time difference and logistics. You've got my wheels spinning, friend. Definitely something I think would be good for my son – kids in general – to experience so that they can see God at work and also have some perspective on gratitude. Thanks for sharing your journey with us! Love this, Kristen. But mostly I love that you and Greg listened to God and went where you felt He was calling you to go. Mission trips are truly life changing. It opens our eyes to both how we can make a difference in third world countries but I think it also makes us more aware of ways we can serve right across the street too. I think of this verse, "From everyone who has been given much, much will be demanded; and from the one who has been entrusted with much, much more will be asked." We have been given much. We really, really have. In one of the Right Now Media Bible studies, Jen Hatmacker talks about how God doesn't want us to feel guilty about what we have but He wants us to be responsible with what He has given us. Hi Kristin … I love that your daughter went with you. What important seeds were planted, and only God knows how He will use all she saw and heard and experienced in the years ahead. I loved reading this…especially about Cate and how she adjusted. And isn't it just like the Holy Spirit to turn our kids' ears to what He wants them to hear?